Raptors are particularly suitable for monitoring persistent, bio-accumulative and toxic (PBT) substances because they are widespread, typically long-lived apex predators, which integrate contaminant exposure over time, over large areas and across a range of specialist and generalist food chains, are particularly sensitive to environmental contaminants and among the first organisms to exhibit readily observable responses. Examples of contaminant problems revealed by raptors include heavy metal-induced immune system impairment, polychlorinated-biphenyl (PCB) induced impacts on reproduction toxicity associated with lead shot in game and toxicity associated with non-steroidal anti-inflammatory drugs (NSAIDs). ERBFacility involves researchers working with analytical laboratories, curators of raptor collections in museums, specimen banks and research institutions, and field workers involved in raptor monitoring and conservation. We call these respectively the ‘Analysis Arena’, the ‘Collections Arena’ and the ‘Field Arena’. See Governance for details of who is involved. 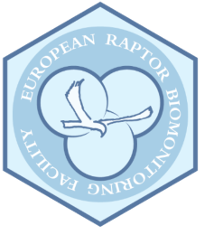 ERBFacility will underpin next generation biomonitoring in Europe by delivering: complementary frameworks for a European Raptor Biomonitoring Scheme, a distributed European Raptor Specimen Bank and a European Raptor Sampling Programme; a meta database of samples; harmonised standards and protocols for analyses and sampling; best practice guidance for sampling; proof of concept for pan-European assessments and harmonised sampling. Is EU chemicals legislation effective in reducing environmental exposure to contaminants in Europe? Are there emerging contaminant problems needing remedial action? In this way, ERBFacility will improve effectiveness evaluation, risk assessment and early warning in relation to regulation of priority substances, plant protection products, biocides, veterinary products and heavy metals. ERBFacility is timely and relevant given the shift in chemicals regulation from national to EU level and EU policy for a non-toxic environment. ERBFacility fills a key gap in wildlife biomonitoring and complements recent European developments in human biomonitoring. See Aim and Objectives for further information. What raptor samples are used? Biomonitoring involves no harm to raptors. It makes use of existing specimens and samples in environmental specimen banks, natural history museums and other collections. These derive from birds found dead in the wild. Where samples from live wild birds are needed, this involves non-invasive sampling methods (e.g. collecting feathers from nests) and is done under relevant permits, typically during ringing to minimise disturbance. The formal description of the Action is given in the ERBFacility Memorandum of Understanding, available on the COST website here.